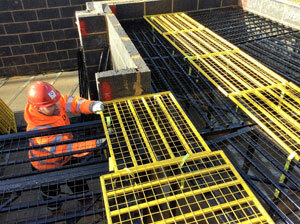 Rhino Deck Platforms are a high-load work platform system for a safer and faster build. 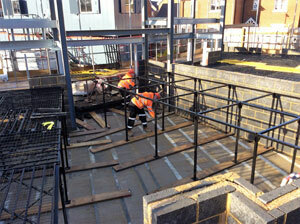 The Rhino Load Deck System is designed for use inside a building during construction. The system can be installed to provide a safe access platform for site operatives and therefore reduce the risk of fall potential. Perhaps its greatest benefit is the speed of installation – up to ten times faster than traditional scaffolding and needing no hand tools or special fasteners. That means lower cost and less disruption to the project at hand. There’s real versatility, too. For a start, the system is free-standing – it does not require standing walls for support. Its flexibility means that it can match irregular floor plans, without leaving gaps or voids. Moreover, it can be raised in height by building onto the legs and raising the framework and deck panels. For use as a wall-to-wall safety platform, trestle and handrail set-up or mobile tower arrangement, the Rhino Load Deck provides unrivalled versatility, ease-of-use, strength and durability, and cost-effectiveness. It can also be adapted for use as a ‘catwalk’ arrangement for access inside timber trusses. a significant decrease in downtime. Rhino Deck is a highly versatile 3-in-1 solution for access, loading and working. The Rhino Load Deck system can support loads rated at up to 600kg per square metre at a 3 metre platform height. It can be installed quickly and easily allowing for safer working at heights of up to 4 metres. The lightweight components lock in place without the need of tools or fixings and the materials used minimise weight without compromising strength and durability. Rhino Deck is unaffected by the weather extremes and is compact, making it easy to transport and store onsite. If you would live to find out more about our Rhino Load Deck systems then please contact us on 02380 227088 or fill in our contact form.